Grand Tribunal - a board game of magical invention. Imagine a world where myth is real, where wizards wield magic beyond the ken of other mortals. Imagine yourself as one of these mages, dwelling in a mystical bastion with your allies and servants, unlocking secret powers and creating wonders. Every thirty-three years the Grand Tribunal is held, attracting other wizards from far and wide to show off their magical creations for the inspection and approval of the archmages. These powerful judges vote on the best, and invite the winner to join their ranks as a new archmage -- a true master of the art of magic! 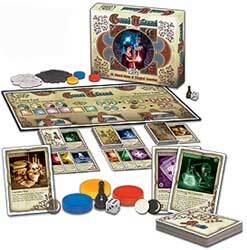 Grand Tribunal is a board game for three to five players, inspired by the Ars Magica roleplaying game. In Grand Tribunal, players use Vis tokens to activate cards representing magic item types, spell categories, and resources, which they then assemble into powerful magic items. Each round, players place their votes for the item types and spell categories they're most likely to be able to play. Three times during the game -- at the periodic Tribunals -- players are presented with 1st-, 2nd-, and 3rd-place awards for creating magic items with item types and spell categories that match those with the most votes. The player at the end of the game with the most points based on those awards wins!